Every couple should decide how much to spend on an engagement ring based on their individual circumstances, not on a preconceived notion put forth by fashion magazines, celebrities, or jewelry designers. By considering a number of factors, it is possible for every couple to find a beautiful, meaningful ring regardless of their budget. There is no simple formula for deciding how much to spend on an engagement ring. When ring shopping, the couple should try to work together and set guidelines that they are both comfortable with adhering to. Some couples cringe at the idea of an engagement ring that costs less than $1,000, while other couples refuse to consider anything over $1,000. Engagement ring prices vary widely, from simple, small rings with price tags under $100 to hefty designer creations using rare stones that may cost $1 million or more. How much a couple spends depends on what they feel comfortable with. For example, a groom-to-be may want to make a statement about how well he can provide for his future wife, and therefore he'd prefer to purchase a more expensive ring. A woman who works with her hands frequently and knows the ring may become damaged, however, may prefer a more affordable ring that will not be as great a financial blow if it is damaged. In general, spending either too much or too little on an engagement ring may make either individual feel intimidated, ashamed, or otherwise uncomfortable. The best way to resolve these problems is to discuss budgeting before purchasing the ring. Shopping within that budget rather than first finding gorgeous rings that may be far outside your current financial reach helps avoid disappointment and financial stress. Are you curious about what others are spending on a ring? This can help some couples decide on their price range. 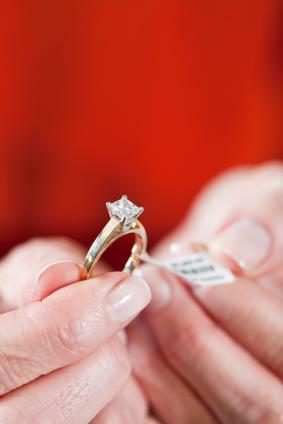 The average cost of an engagement ring, as reported by WeddingStats, is anywhere between $4,550 to $4,890. Of course, that average means that some people are spending substantially more while others are budgeting far less. Cash: This is the least risky option because the couple can only spend what they physically have and there are no interest fees or other penalties. Credit card: Credit cards can give the couple payment flexibility, but investigate finance charges and interest rates beforehand and pay the balance as quickly as possible to avoid paying two or three times the actual cost of the ring. Store financing: Many jewelry stores offer in-house financing, typically short-term arrangements with better interest rates than credit cards. Couples need to apply for the program and will be accepted based on their potential credit risk, but this is a good option if only a few weeks or months are needed to pay for the ring. Bank loans: This is a risky option but allows a couple to not only purchase an engagement ring, but also to secure financing for other wedding expenses at the same time. Investigate all terms and conditions before agreeing to any loan. Many couples are initially disappointed to learn they are financially unable to purchase the ring they want. There are many cheaper options, however, such as adjusting the quality or type of gemstones, choosing a less intricate design, or looking for a more affordable jeweler in order to meet their style preferences. The key is to remember that the engagement ring is a symbol of a much more important relationship - whether that symbol costs $1,000 or $10,000, the love and commitment remains the same. Couples should decide how much to spend for an engagement ring only after careful consideration of their budget, future expenses, and payment options. While a particular price tag may seem cheap or expensive to different couples, the most important factor is to purchase a ring that expresses the deep connection between the couple, regardless of its final price. That relationship, after all, is priceless.